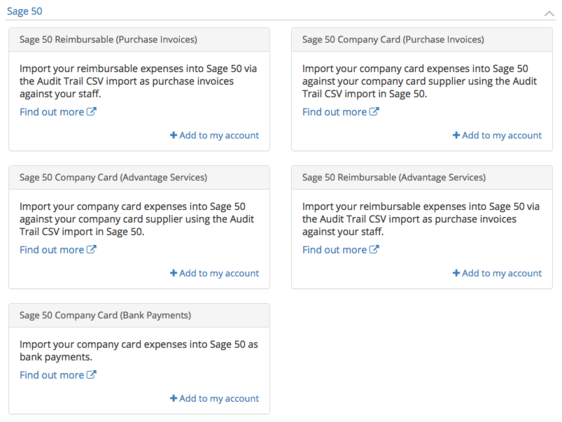 If you want to import your expenses into your Sage 50 account, we already have a Sage 50 CSV export format available. ExpenseIn uses a powerful CSV building tool that can be easily customised so data exported from ExpenseIn can be imported directly into Sage 50 with the simple upload of a CSV file. We recommend that you have a look at the Sage 50 Import Documentation to ensure you understand how the import works. Before you add your Sage 50 export formats to your account, you will want to match the references you have within Sage 50 package to the ones in your ExpenseIn account. This will allow the data to pull through correctly. Click Edit next to the category and input the reference that matches your nominal code in Sage 50. Check out our Categories help article for more information on category configuration. If you’ve set up your users up as suppliers in Sage 50 you will need to Edit each user and input the A/C Reference number from Sage as the Reference number in ExpenseIn. The Tax Codes in Sage (I.E T1 – Standard Rated) will need to match the VAT Reference in ExpenseIn. If you are recording Departments in Sage 50, you should use the same tracking name for these in ExpenseIn. If you are recording Projects in Sage 50, you should use the same tracking name for these in ExpenseIn. If you have any analysis codes in addition to departments or projects that you wish to capture then these will need to be set up as a Custom Field. Navigate to Custom Fields in Admin. 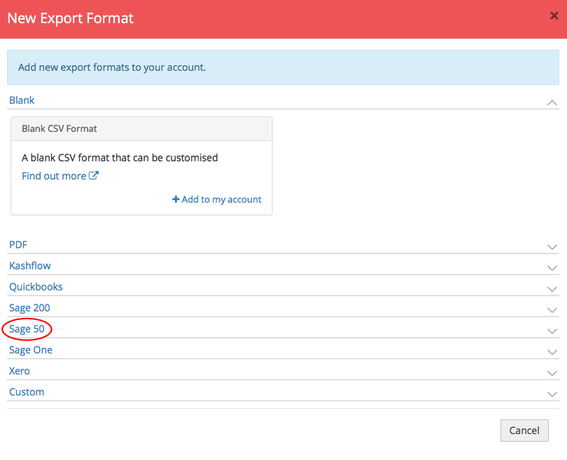 Now that everything has been set up in the Admin area, you can now add the Sage 50 CSV export format to your account. 3. Click the Sage 50 dropdown. Click Edit if you want to view the mappings between the ExpenseIn fields and Sage 50. We automatically use the names of the columns that Sage 50 requires so that the import process is as easy as possible. If you are using cost codes then you will have needed to have created a Custom Field for this earlier. Once you have done so, find the Cost Code Reference at the bottom and change Static Value by clicking the dropdown box and then choosing your Cost Code custom field from the list. Please note: If you wish to create negative expenses on your account, check out our Advanced Settings article to toggle this setting on. Before you get started, make sure you have set up the above references. If your company card is set up as a Bank Account in Sage you will need to change the Transaction Type from PI & PC to VP (Visa Payment) & VR (Visa Credit). On the second line, you will need to add either the Supplier Reference or Account Reference that the card is set up within Sage rather than the reference of the employee supplier. 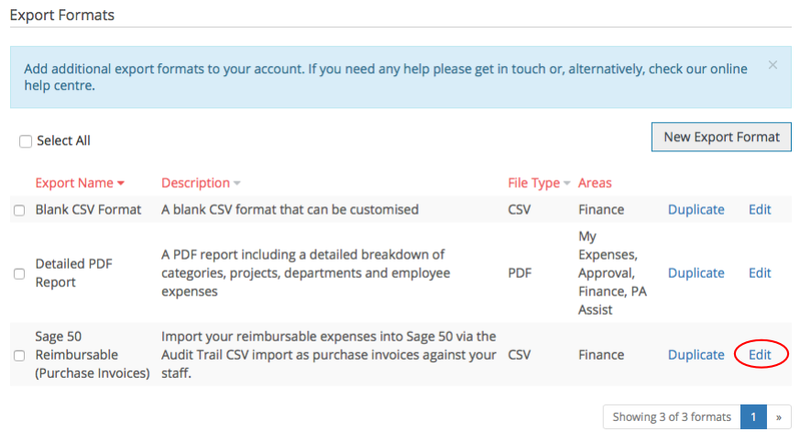 Now that your account has been mapped to reflect your Sage 50 package and the CSV export format has been added, you can now export your expenses using this format in the Finance area. Check out our Export expenses to CSV help article.